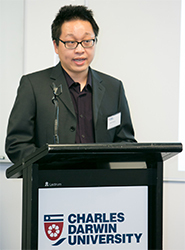 CDU Sydney now offers undergraduate and postgraduate business courses for international students in Sydney. Not only will you have access to the latest technology at the learning centre, but you'll also be immersed in real-world experiences studying in the heart of Sydney's Central Business District (CBD). CDU Sydney offers a range of services to help you gain the most from your studies. As your first point of contact, knowledgeable reception staff are on campus to point you in the right direction. If you are facing issues with your CoE, visa expiry or any other international student related issue, our International student support team are available to assist. If you are unable to find the answers you need on the website by visiting our Current International Student page, you can contact the international student support team via email at international@cdu.edu.au. There are also a range of other services available at Charles Darwin University, which we encourage you to utilise. Counselling – Free and confidential counselling is offered to all CDU students by a registered counsellor. Sydney students can access this face-to-face or by phone through pre- arranged appointment, or on the CDU run after- hours crisis line. For more information on how to book, please visit the Equity Services website. Disability Services - If you have a permanent or temporary physical or sensory disability, learning disability, medical illness or a psychological condition that may impact on your ability to access and participate in study and other services at CDU, you are advised to contact the Disability Liaison Officers. Find out more at Disability Services. Study Support - The Academic Language and Learning Success Program (ALLSP) offers a range of services to all CDU students. ALLSP offers free workshops aimed at developing academic skills needed to succeed in university studies at both the undergraduate and postgraduate level. All workshops are delivered online, at scheduled times. Archived lectures are also available. To find out more information, visit the ALLSP website. Library Support – Provides assistance on researching credible resources via Library Search and online databases, provides an initial reference checking service and provides information resources via LibGuides. Library also offers face to face workshops on researching subject specialist databases for assignments and trainings on EndNote.